D.L. Hughley will debut his new syndicated afternoon show soon in what he calls a "soft launch." The show is tentatively schedule to launch on August 12th or 19th. Hughley will be joined by comedian Steve Wilson and an unnamed female host. He talks about that process in the [VIDEO] below. After next week's launch, Reach Media, the company founded by Tom Joyner now owned by Radio One, will look to syndicate the show into major market Urban AC stations. The show will also be readied as a replacement for The Skip Murphy in the Afternoon Show. What has not yet been revealed are the stations that will air the show. Does anyone believe that D.L. Hughley inked a deal do this new radio gig without a promise to have his new show aired in Top 10 media markets? Will Radio One look to move some afternoon DJ's to midday or evening time slots to make room for D.L. in their top Urban AC markets? (you bet.) Will D.L. Hughley play Old School music in between his comedy bits that are political in nature? 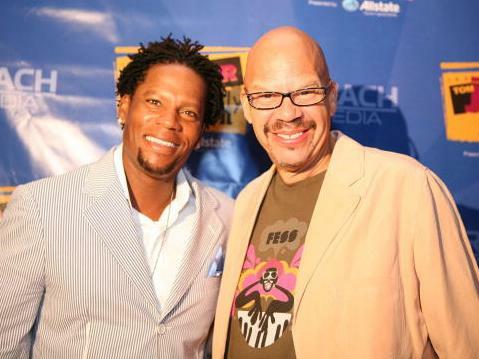 (of course) Sources also say that Reach Media wants Hughley to relocate to Dallas permanently, (which is the home base for The Tom Joyner Morning Show) to do the show, but D.L. wants to do the show from either Los Angeles or New York.